Yearbooks were a hot commodity last year and we sold out! You won't want to miss out on this year's limited edition collection of our school's stories for 2017/18. Our Yearbook club of 6th & 7th graders paired with volunteer parents will try to outdo last year so your child can relive all those special moments from the year. Yearbooks are for sale at the lowest price of the year and can be purchased on line only at Jostens (http://www.jostens.com/). Take advantage of our Back to School special pricing until December 22ndand free icons with personalization! We would love for your child to be in the yearbook this year! Upload RePlayIt on your phone today! Submitting photos has never been easier! Send them to our Yearbook team directly from your phone, computer or tablet using our RePlayIt app. Visit http://www.replayit.com/r/ or search for the app in your App Store and start uploading! Accepted formats: Photos need to be in jpeg format, clear focus and as high resolution as possible. 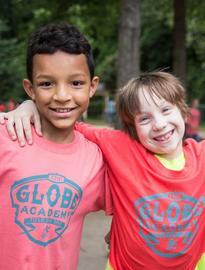 Subject matter: Please make sure the photos you send are during a GLOBE event, classroom, or generally GLOBE related. GLOBE is very pleased to offer Yearbook Club for the 6th and 7th grades. With a curriculum created by Jostens, the students will learn photo editing, page layouts, interviewing skills and much more. The club will take several field trips throughout the year and will be involved with our volunteer parent photography team in capturing the moments from the year. The skills learned and used in Yearbook Club will last a lifetime. For more information, contact Kate Staelens, Yearbook Advisor at kate@staelens.us. Are you a photographer? Join our Photography Team at all school events! Contact Claire Abel at gaclaye@gmail.com for more information about photography and how to join our busy team of passionate volunteer photographers. here, and Amazon gives a percentage to GLOBE. Bookmark it - and use it every time you shop!